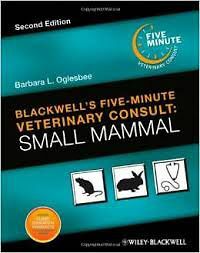 Blackwell's Five-Minute Veterinary Consult: Small Mammal brings together a wide range of information on diseases commonly seen in small exotic mammals into a single, accessible resource. With consistency and broad coverage unparalleled by other texts, this new edition adds sections on chinchillas, guinea pigs, and rodents to the existing rabbit and ferret topics to offer complete coverage of these popular, yet less commonly treated, species. Detailed, up-to-date information on the diagnosis and treatment options for all disorders commonly encountered in exotic companion animals is readily accessible, making this a go-to reference for any veterinarian seeing small exotic mammals, regardless of their experience level with these species.